"This is an amazing appetizer, which will be eaten in seconds. I can never seem to make enough. Everyone loves them and asks me to make every time." 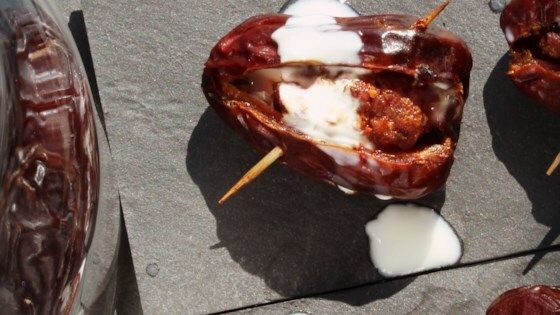 Place a chorizo piece and a few garlic slivers inside each date. Close each date using a toothpick. Arrange the stuffed dates on a baking sheet. Bake in the preheated oven until heated through, about 10 minutes. A spicy meat ‘n’ cheese dip for football season!